Explore aspects of campus safety through visualization and interactive mapping. Campus Blue Lights, the illuminated phone kiosks distributed throughout campus, provide emergency communication and promote a sense of security through their distinct illumination. 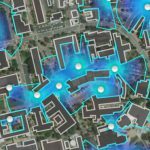 In this demonstration, explore how interactive mapping tools can be used to visualize and evaluate the placement of these lights, by modeling visibility in the campus built environment. Students Kira Evers and Briana McEntee, with ESRI Project Manager Mike Ridland and Kennedy Library Data & GIS Specialist Russ White, highlight how GIS (Geographic Information Systems) tools are used for real-world decision support. View the students’ presentation online, as an interactive story map. TGI Wednesday! It's 1:36am right now.